SINGAPORE - Some 1,700 of Singapore's biggest and warmest smiles will be on show for world leaders and delegates coming to town for the Asia-Pacific Economic Cooperation (Apec) powwow. 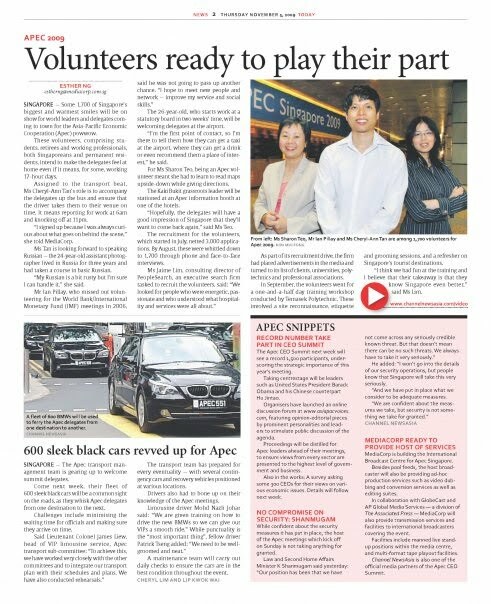 These volunteers, comprising students, retirees and working professionals, both Singaporeans and permanent residents, intend to make the delegates feel at home even if it means, for some, working 17-hour days. Assigned to the transport beat, Ms Cheryl-Ann Tan's role is to accompany the delegates up the bus and ensure that the driver takes them to their venue on time. It means reporting for work at 6am and knocking off at 11pm. "I signed up because I was always curious about what goes on behind the scene[s]," she told MediaCorp. Ms Tan is looking forward to speaking Russian - the 24-year-old assistant photographer lived in Russia for three years and had taken a course in basic Russian. "My Russian is a bit rusty but I'm sure I can handle it," she said. Mr Ian Pillay, who missed out volunteering for the World Bank/International Monetary Fund (IMF) meetings in 2006, said he was not going to pass up another chance. "I hope to meet new people and network - improve my service and social skills." The 26-year-old, who starts work at a statutory board in two weeks' time, will be welcoming delegates at the airport. "I'm the first point of contact, so I'm there to tell them how they can get a taxi at the airport, where they can get a drink or even recommend them a place of interest," he said. For Ms Sharon Teo, being an Apec volunteer meant she had to learn to read maps upside-down while giving directions. The Kaki Bukit grassroots leader will be stationed at an Apec information booth at one of the hotels. "Hopefully, the delegates will have a good impression of Singapore that they'll want to come back again," said Ms Teo. The recruitment for the volunteers, which started in July, netted 3,000 applications. By August, these were whittled down to 1,700 through phone and face-to-face interviews. Ms Jaime Lim, consulting director of PeopleSearch, an executive search firm tasked to recruit the volunteers, said: "We looked for people who were energetic, passionate and who understood what hospitality and services were all about." As part of its recruitment drive, the firm had placed advertisements in the media and turned to its list of clients, universities, polytechnics and professional associations. In September, the volunteers went for a one-and-a-half day training workshop conducted by Temasek Polytechnic. These involved a site reconnaissance, etiquette and grooming sessions, and a refresher on Singapore's tourist destinations. "I think we had fun at the training and I believe that their takeaway is that they know Singapore even better," said Ms Lim.